Publisher: Waldo and Van Winkle Publishers, 2002. Hard Cover, 336 pages, 12 x 9.25. This is an amazing book. 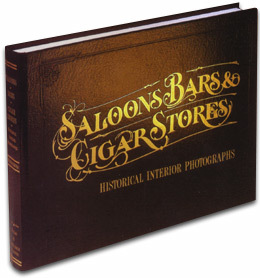 It's a pictorial history of saloons and bars in America, with over 150 vintage duotone photos and 30 color images (mostly post cards). Every photo gets its own full page, so you can spend hours looking at all of the incredible detail. Plus, every photograph is captioned, so you know where the saloon was located, along with other pertinent information about the photo. History buffs and breweriana collectors will love spotting all of the beer and whiskey artifacts that fill the walls and back-bars of nearly every saloon pictured. There's no other book out there like this one. Binding is in heavy embossed leather, with gold stamped lettering. Pages are round-cornered and heavy museum-quality. A top-notch presentation, with great subject matter.